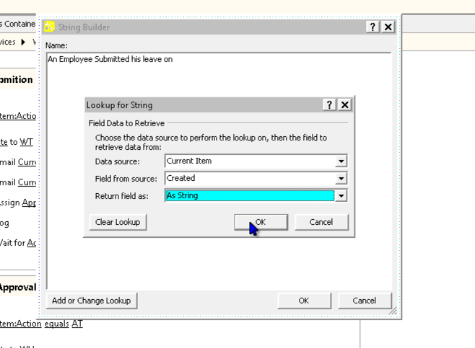 This entry was posted in SharePoint - How To and tagged approval, forms server, infopath 2010, sharepoint 2010, Sharepoint designer 2010, tutorial, workflow. Bookmark the permalink. Superb article, anyone who wants to start learning about sharepoint ,workflows ,desinger ,info path this is an excellent article. Absolutely excellent! Thank you so much for your very detailed explanations! Could you possibly provide information as to how I could update a company calendar indicating approved employees leave? 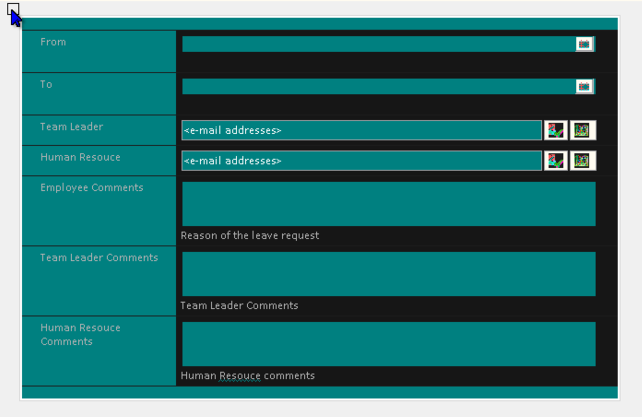 Also, any news on the “people picker” option where team leaders and HR persons are automatically identified? Many Thanks! 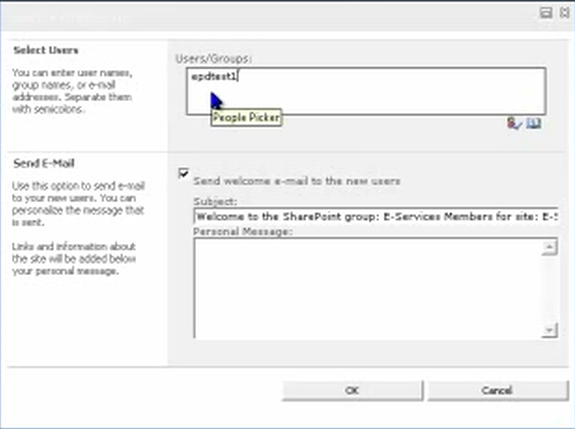 @Graham: You can create new view of type calendar for the leave request sharepoint list, and filter the items that has a State DN and action AH and place it this view on the home page of your compaies intranet. Regarding automatically filling people picker.. Outstanding article. Excellent tutorial, great for beginners like me. 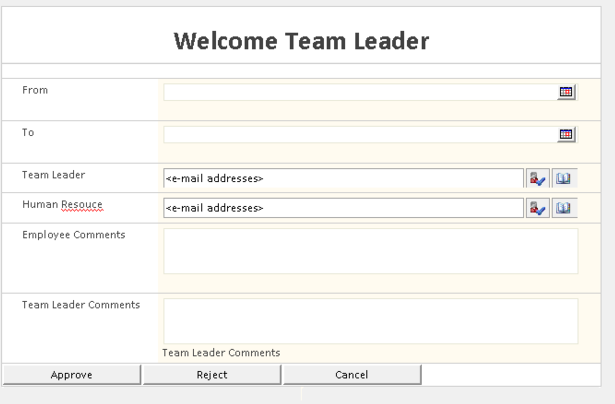 Mine is not a comment but a question, I created the Team leader view and added the Approve, Reject and Cancel buttons. I created all the rules associated with these buttons. When I start the workflow the buttons do not show on the TeamLeader view, would you have an idea what causes this. Please help me. I am having the same issue. The approve, reject and cancel buttons do not show up on the team leader view in Sharepoint. I have no way to approve of reject? Any revsolve in this issue? I’m going to the same thing. I have to click Edit Item on the top bar to view the buttons, but I’d rather have the top bar removed. I’m having a similar issue. Buttons are not showing up unless I click Edit Item in the top bar which I would rather not have visible. Any resolution? I have spent close to a month trying to custom design InfoPath 2010 forms and implementing them into SharePoint 2010 workflows and haven’t been successful. Adding the reject button was my biggest issue and you explained that so well. The workflow I am working on is project approval which amazingly is very close to the your leave request workflow lol. Your instructions with the valuable videos are worth a million dollars! Your instructions are so good that I consider them much much better than the Windows training videos I have been watching. Well done Jamil!! and once again Thank you very very much. I especially like how you added a little humor to your video. When you were typing the leave request reason as ‘I am not feeling well..’ you said, “I am really not feeling well”. That was hilarious! Thank you for the nice words… It is great that this was helpful for you! 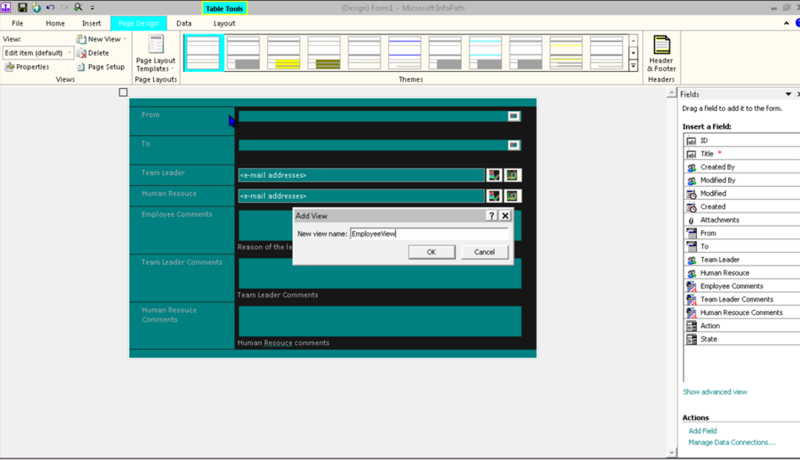 I had to re-visit your blog to build yet another workflow using InfoPath forms and SharePoint designer. This time I can view the buttons only on the view which is setup as default and not the other views. Currently I have 5 different views. I do not want to show the InfoPath commands in the ribbon or toolbar. 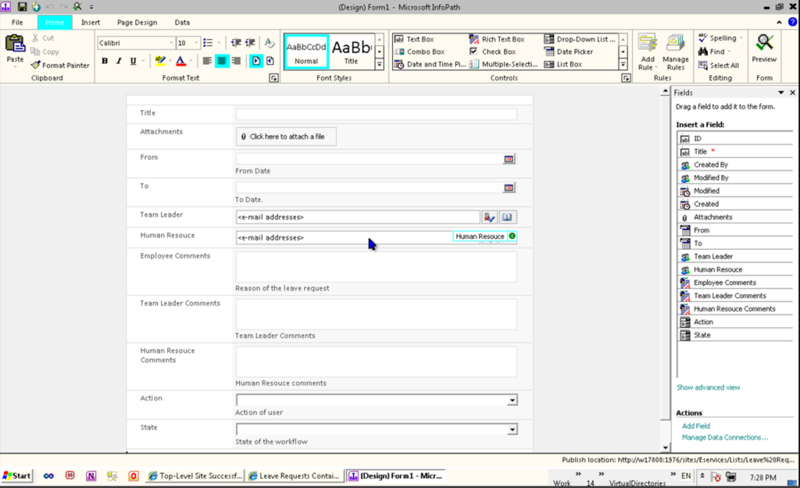 I am using SharePoint 2010 Enterprise with embedded InfoPath form. I am using a List. I am replicating the steps you provided and have three questions. 1. When I add a new item, I am still seeing the original Default form was first created. I am not seeing the Employee View. What did I miss? 2. The buttons on each form have to be clicked twice for the form to close. I did make sure that I have the ‘Close this form: No Prompt’ action for the buttons. What did I miss? 3. How do I hide the top ribbon when a form is being filled? The ‘Submit, Reject, Cancel’ are the only options I want the users to see. I have resolved the Default form and the hiding of the top ribbon issues. I am still looking for the button issue. Any help in this regard is highly appreciated. how to resolved your issue, i m facing ur problem. pls help me. Excellent post. I am only having problems immediately after task assigned and it is approved all the status changes on the list but the probelm I am facing is that it cannot proceed after this to log, send email to next for notification and workflow remains in progress, how can I close this, I am on fire to amke this work today. Help!!!!!!!!!!!!!!!!!!!!!!!!!! I follow the steps to create a form library and workflow in the demo. 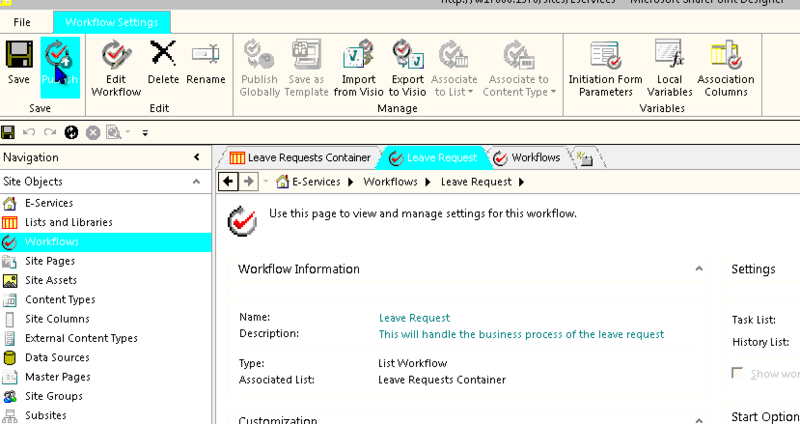 But my workflow only trigger when a leave request is submit(first step) and change the “state” to “WT”. 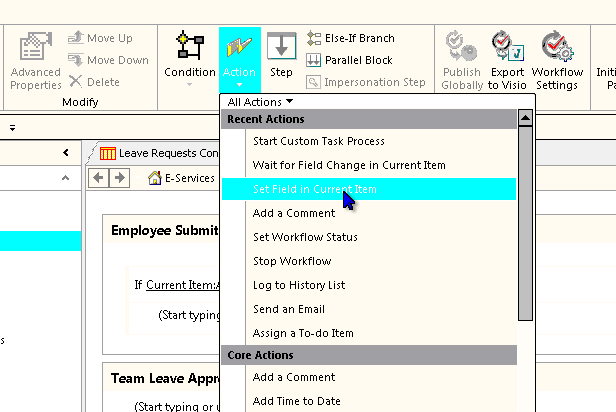 It stop the workflow at rest of steps such as even manager approved the request and change the “action” to “AT”, the work flow does not continue. I tried around but have no solution. this is urgent. Could author or anyone give a clue about this. Why workflow stop after first step. I do include “wait for action not to equal SE” in the end of first step. I have to go to workflow task list to manually change status to “complete”, then work flow continue. I figure it out that sharepoint workflow have a delay between steps especially if you have submit the document, it need to wait for document unlocked and released to access to it or change field in the document. You have to go to central admin – timer job status – workflow to set workflow run every 1 minutes instead of default of 5 minutes. This trick caused me to puzzle for a week. Great article. Based on this, I ended up using two workflows to implement a state-machine kind of logic without using Visual Studio — all in Sharepoint Designer 2010. Can you share how you implemented this type of state-machine kind of logic 😉 ? This was by far the BEST tutorial I have seen on using InfoPath & SP Workflows!! Thank you so much!!! One question, I have setup my workflow to send an email to a person once the form has been submitted. I would like for that user to be able to click a link in the email to go to the current view of the form (i.e. 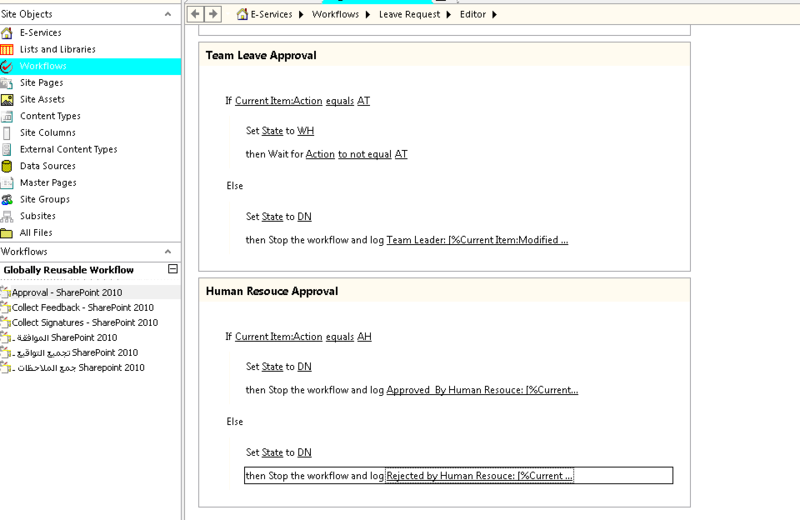 Team Leader Approval) so they can see the request and approve or deny but I can’t figure out how to make that work. It would be even better if I could just email the form to the user, but I’m worried that will be even more complicated. Hi Traci, watch the video on the below link. Your answer will be found from 2min50sec onwards. a perfect article. Sir, please share more. thanks for your efforts. I have executed all the steps & my switchviews & worklfows are working perfect. Now I have a question here. I want to restrict views /hide buttons using roles. Currently employee can also approve the request. I want Employee should not be able to approve as TL or HR & TL should not be able to approve it as HR. I tried a scenario (When it is approved by TL & in WH state) using the following approach. Create a Rule on Form Load where I mentioned that if state =WH & created by (AccountId=concat(“domaon”, userName()) then switch to new view that doesn’t have approve or button. But this is not working. Can you please help me out here?? Hi Javed. 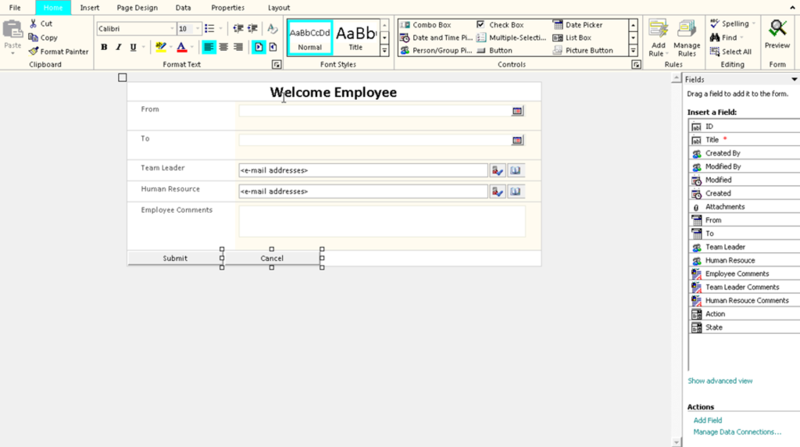 When I will create a new form, the default is not employee view. It shows access denied. So I need to change the view same thing with the others. When I tried to submit the employee request, the state did not change in to WT. Please help me with this. You may email me at mjosephbautista@yahoo.com. great job! i would like to thank you for this effort, however i have a question redaging to Reject the request, because the 7th video focus only on Approve the request, could you please give us the steps needed to implement the workflow of rejection on each stage of the workflow. This is a wonderful tutorial! Thank you! I am having some issues and am hoping that someone can help me. 1. 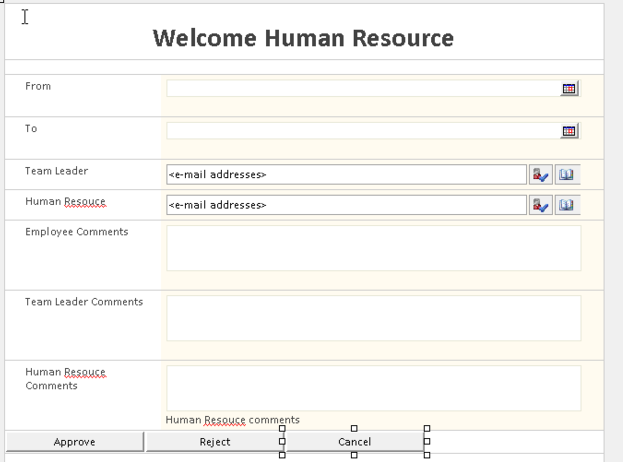 How would I remove the Human Resources field and still have functionality? I don’t want users to have to type in the same address for HR every time they submit a request. The request will be going to the same HR staff members every time so I don’t see why this field would be necessary. 2. As I am testing, every time the “team leader” goes to approve or deny, the form goes to the access denied page. I created the test group as mentioned above and everyone seems to have the right permissions. 3. For some reason, the “state” never switches to “waiting HR”. It goes from “waiting management” to “complete”. I checked the workflow and it is set up according to the tutorial. If anyone can help me with these I would be extremely grateful. Again, thanks for the awesome tutorial! we use office 365 and we dont have any server as everything is managed by Microsoft. my question is how to carry out this task using office 365 , share point designer, infopath. can I implement this or do i need some other resources? Iam giving permissions to Three views. The following events have occurred in this workflow. An error has occurred in LeaveRequest (1). Please Find The Above Attachment and Let me know Where Is My mistake. Excellent article, I must say, this is a very valuable contribution to those who want to learn Sharepoint 2010 workflows, Infopath forms etc. Excellent article. I was looking for something like this. Being a beginner in sharepoint ,this article made my life so easy. Thank you .! Jamil you’re such a great resource. Keep sharing your insightful knowledge. I have started studying the Sharepoint recently. Your article was very useful in understanding the WorkFlow and InfoPath forms. Excellent article! very helpful for beginners..Thanks! Really a very helpful article, however, when i publish the form i don’t see any of the buttons. Submit, Reject & Cancel none of them. I need to create a workflow to assign an InfoPATH 2010 web form to a manager for approval..The manager is not the submitter’s manager so I need the submitter to tell me who approves requests for that unit. My process is – the submitter completes the form submits it to a document library and a workflow runs “collect data from user” “fromCurrentItemCreatedBy” to get the approver’s name, The user selects the approver from people picker and output is to “variable:DivDC” Then I start an Approval process on current item with variable:DivDC. This is all a single workflow step and I am not sure if this is correct. So far the workflow initiates and the task is generated, the user receives it in Outlook and is able open the task; pick the approver and complete the task. But then the workflow status shows error occured. When I goto View Workflow reports the report has no data so I am not sure where the problem lies. A great article indeed Jamil. Thanks so much for sharing this with us. I followed the example and created a Software Request form, with three view. Employee,Approver and Denied. Two states WA and DN. I created rules to switch views as per the article. If State ‘is not blank’ then Employee view, if State ‘is WA’ then Approver view and the concat conditions for Rejected View. Employee view loads. But upon saving the form and changing the State to ‘WA’, switching to standard view and then clicking the item, Approver view ‘does not’ open. It still opens the employee view. Can you or someone who got this to work tell me what is wrong and what step I missed? Great information it was a life saver for me!! Thanks a ton and please keep posting such information which really helps a lot of us out here !! What a nice article. Nice one. Whenever I activate the access denied view and I publish to Sharepoint, After filling a new form and I try accessing the form with the account ID it was assigned to it displays the access denied page. 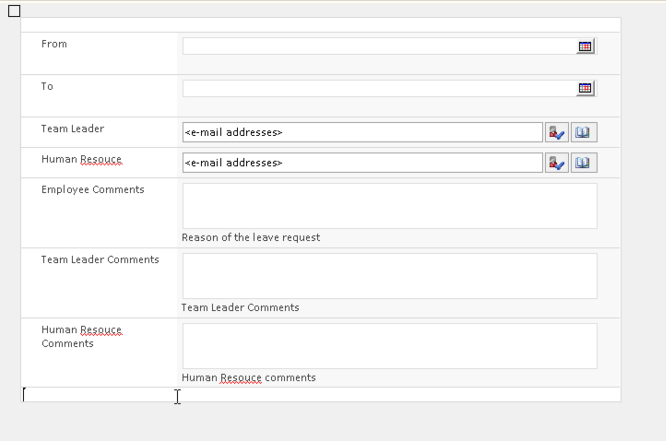 Also when I publish the workflow, after filling a form the teamleader doesnt get any email. The email he gets is for Task assigned to him. When he clicks on edit, it throws error. Thanks for posting this solution, it was very helpful. However, i was hoping if you can help me out with one more step further. I want the basic information displayed on a calendar list. Hi Jamil. This is a great tutorial thanks for sharing! I have a question I hope you can help me with. When the task is created is there a way to close/complete the task when the form is approved? Jamil thanks for the tutorial. I was wondering what the answer was with regard to not being able to see the buttons within SharePoint on the form. I created several views. 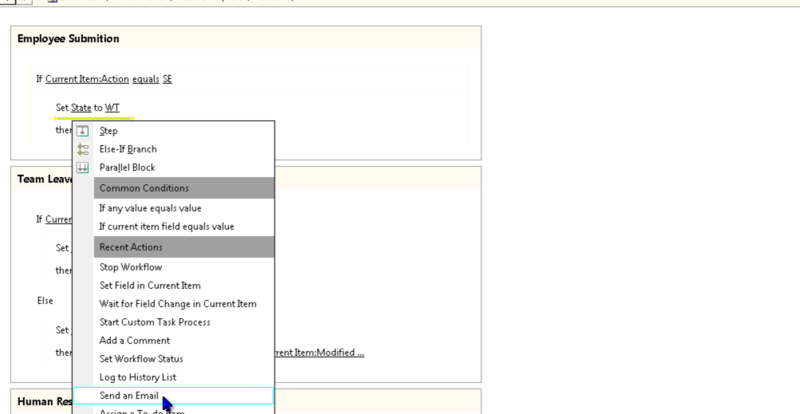 On a request submission view, the submit and cancel buttons are visible in SharePoint but on the successive views the buttons are not visible (unless I select Edit Item in the ribbon). I have looked at all views and I don’t see any formatting etc differences between the submission view and the others which would explain why the buttons would not be visible. Any assistance is appreciated. hi i have worked throught the videos and create the list, the infopath form and the sharepoint design form, but still some gaps, i wish you could help to solve them because the leave request is a very interresting issue that we all can benefit from. 2- Human resources doesnt receive the email notification only the team leader does. 3- if the Access denied view is enable, and when the action is AT, when we click on the item to give the HR approval it gives us access denied page. 4- when the team leader access the item to give his approve or rejection he should click on the “edit item” to edit the form and not by default. Hi Rawane. We have the same problem. 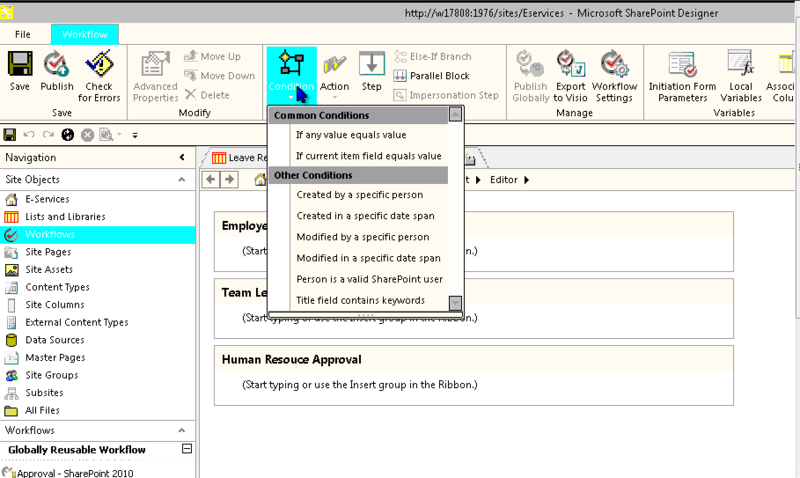 The Access Denied view is the default and I also encountered that Edit Item is also the default instead of Employee Views, et al. I hope this would be going to be addressed to us. 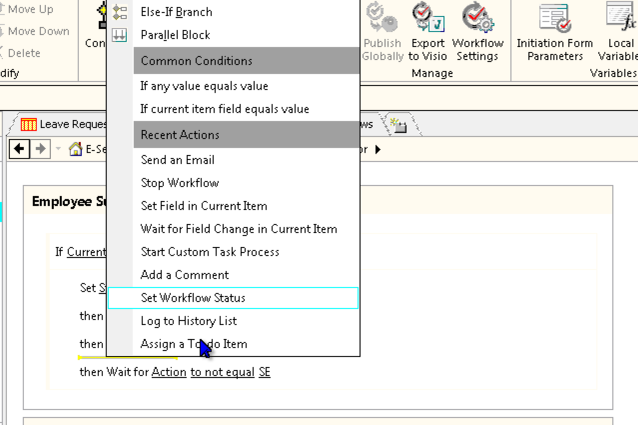 Nice article…thank you for sharing valuable information about Info path with SPD workflows. Hi Jamil, thank you for posting excellent videos. It helped to learn the workflows and implement similar kind of scenario at work. I have a question in handling the rejection scenario. If Team Lead rejects the leave approval then employee would be notified about rejection and employee should be able to edit the form. Also When HR rejects the leave request then employee should be notified of rejection and employee should be able to update the information. Now when employee resubmits the request HR should be notified and HR should be able to approve or reject the leave request. Here we will be bypassing Team lead since has approved initial request and when employee resubmits the request then only HR will be notified. Could you please help me in handling this scenario. Any help will be appreciated. Thank you! This article help me a lot for my project.I have some issue that i have requirement to attach files by employee and the manager can able to open that attachment only.But in manager view when i added attachment control,there manager able to the attached file by employee.So please help me how to make that attachment read only and cant be deleted by Manager. I have created same one using this article.But now problem is how to create a solution(.wsp) file of this project and deploy it in my production server. This has been of the greatest work ,simple and easy but for some reasons i do not know why my send email option is not working the way it is for you. could you give me some inputs on this. Then u need to make sure that “work email” property is set to the right email for the user who is expecting to recieve an email. Yes i did the same it was kind of working yesterday but unfortunately it does not work today. The moment i added the task assigned to do list, the workflow has been stopped, I am assuming that i am doing something which is not letting the workflow work. The first sendemail to the created by person is working but when i see the team leader it does not intimate anything to the leader mailbox. any inputs? I have created the similar in sharepoint 2010.But now i want to create this in sharepoint 2013.I have added the list template and created the 2013 workflow with the above steps.But the workflow jump to last step after employee submit. Please help how to do this using 2013 workflow. Thank you so much for this! What a life saver. For anyone else wondering – this does work on SharePoint Form Libraries as well as lists. (Using SharePoint 2010 and InfoPath 2010). However, if you create the form in InfoPath and set the choice values for the State and Action fields then promote them to the Library – they do not seem to show up, at least not in my dev instance. 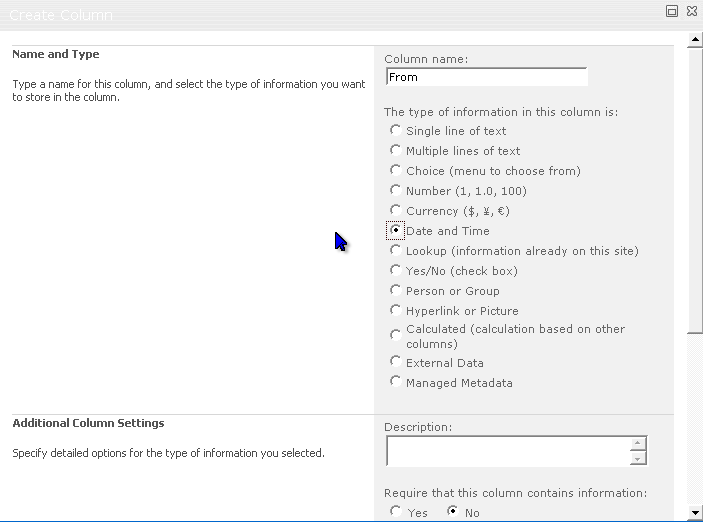 You have to go into the Library Settings tab in the library ribbon in SharePoint then click on the columns and set the values that way. This problem had stumped me for a while. My only issue is that when trying to view an item as team leader when the state is WT, it always shows the Access Denied view instead of the team leader view. The employee also gets access denied, but that is to be expected. I’m assuming something in the logic that’s comparing the account ID to the current user isn’t working. It would be nice if there were a way to see what it’s actually outputting as “userName()” and AccountID so I can tell what’s off. When I submit Employee Page.It is showing me error and wants comments for Team Leam. I think this is a great article. I wanted to know if its possible to start the workflow for more than 1 approver.Can you help me with that. Thanks a great deal for this article. I didnt know the first thing about workflows and this guide has been more than helpful. However, I have a slight challenge: Despite the fact that I followed the instructions in the video to the letter, my form keeps loading the AT (Awaiting Team Leader) view by default. I have gone an modified the STATE column on the list to replace the default value of AT with a blank. yet, nothing has changed. Can anyone be of help please. I am facing issues in workflow.My state is not changing for AT to next stage. Great stuff u have compiled there man, was in a novice it regards to sharepoint, infopath and sharepoint designer, now i have a great deal of understanding thanks to you man, i followed all your steps and created everything in your tutorial but my work flow seem not to be executing, its not changing the states unless i manually do that, also email notifications are not working, could i have missed some configurations along the way? I have a problem, when I turned off toolbar on infopath, the approver haven’t seen the 2 button ( Approve button and Reject button). How can I to resolve this problem. Please help me. I heave a problem, when team leader already login. He open the form but he hasn’t seen the 2 button ( Approve button and Reject button). How to show 2 button? please help me. Is the procedure the same with sharepoint online on office 365 with infopath 2013? You are checking if the “STATE” is WT or WH and then switching views to TL view or HR view. But where are these “STATE” set to WT or WH in the form. With Infopath, it is not possible to add custom fields. I wanted to know if it is possible to create the same forms in sharepoint forms designer? Is it possible to replicate concept of different view in forms designer? Thanks for helping to create Approval work flow. Hi, your post was very helpful! !But i have some problems i would like to know if exist other way to switch to “Access denied ” view without using people picker field, with a fixed value for example. Following your instructions, everything works for except the else function. I mean when I click on Approve button, it changes state to Approved and sends email, but when I click on Reject button, it does not change the state to Rejected or send email. Really Good, thankx for so much detailed blog. learned a lot, keep it up.